Bowie style geometry, the Damascus steel blade has been folded by hand to create the intricate layers. An acid bath had darkened the steel, making the layers more visually pronounced. Two blood groves run in parallel above the defined edge. In classic Bowie style, he spine tapers and swoops down to meet the blade's piercing tip. Fileworked steel and brass are intertwined around the guard and pommel with striking contrast. 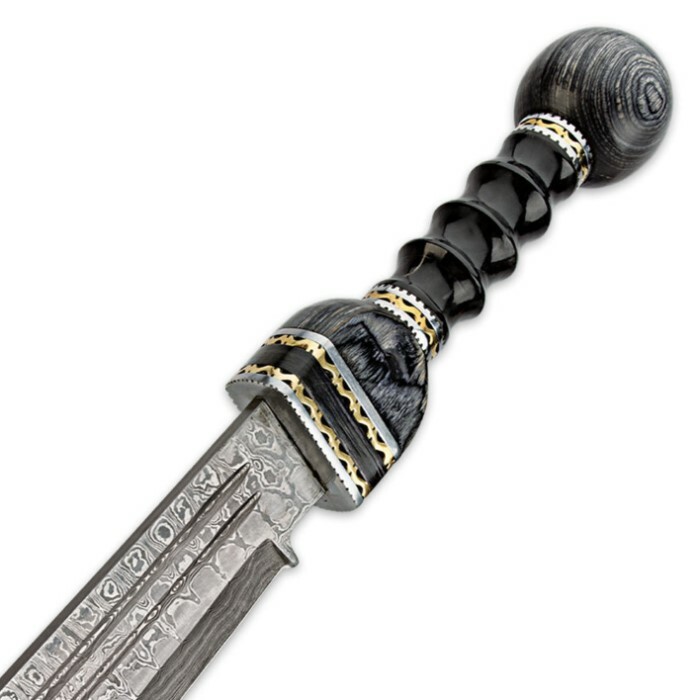 The brass detail adds a burst of brightness to the swords smokey features. Onyx black Buffalo bone makes up the ripped handle grip, while darkened hardwood offsets the fileworked accents. Measurements: 18 1/4 in. blade, 26 in. overall. 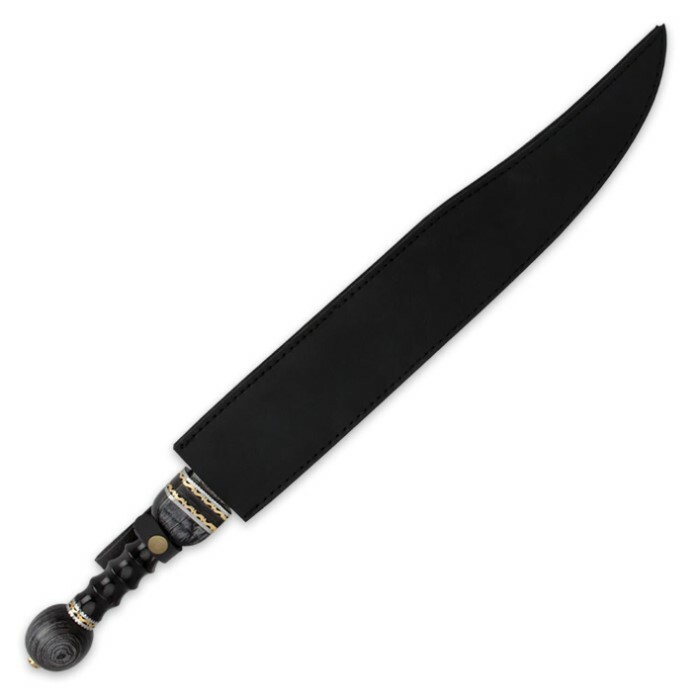 A leather sheath is included, complete with belt loop and snap closure. Just received this today, and I'm very impressed. The sword itself is extraordinarily beautiful, as is the handle. It's got a good weight and swings very well. No damage or rusting during shipment that I can see. The sheath it came in isn't that great, though. The first time I went to sheath the blade, it got jammed at the end (where the tip tightens) and went right through the stitching. It takes some time to get used to putting it away, but it draws amazingly well thanks to it's size. I may be considering picking up another one. Bought this a couple of months ago during s site wide sale. 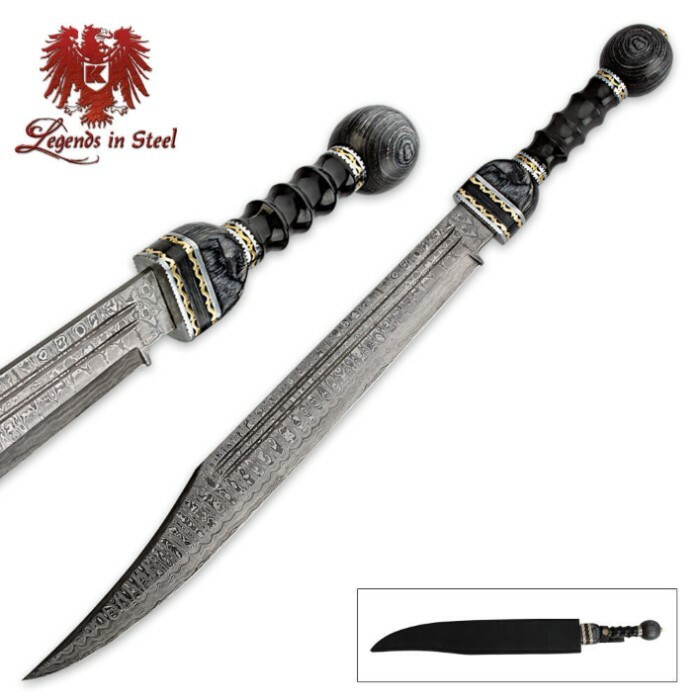 Very nice sword. Came with some rust on the steel pieces in the handle but otherwise everything else is good. Very happy with this purchase. Would buy again and recommend to others.